Jagan Institute of Management Studies takes the Swacch Bharat Abhiyan (Clean India for Healthy India drive) movement forward. JIMS organized Swacch Bharat Abhiyan at its campus on 18th October 2014, 11 A.M. onwards. 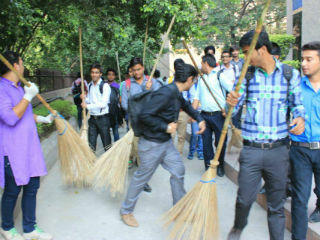 JIMS alumni, staff, faculty members and current students set out with a broom with a pledge that India can’t remain unclean any longer. 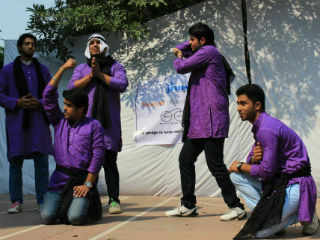 The event started with the Nukkad Natak on “Swachh Bharat Abhiyan” by our undergraduate student club ‘Sankalp’. 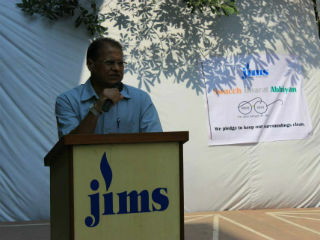 Dr. J.K. Goyal,Director, JIMS in his inaugural speech congratulated all to be part of the noble cause. Speaking on the occasion Dr. J.K. Goyal,Director, JIMS “We are pleased to organize Swachh Bharat Abhiyan at our campus and we feel proud to be part of our Hon. Narendra Modi’s vision to achieve “Swachhta”. Mahatma Gandhi had said “Sanitation is more important than independence”, therefore it becomes our responsibility to accomplish the vision of ‘Clean India’ taking this campaign beyond politics and inspiration by patriotism”. Further, he invited JIMS Alumni Association Member to take it forward. 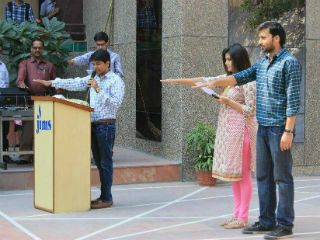 Present on the occasion, our Alumni Association members appealed the entire JIMS fraternity to take the oath “We pledge to keep our surroundings clean as it becomes our responsibility to clean India and serve our nation” and invited the JIMS fraternity to start the campaign from the campus itself. Mr. Manish Gupta, Chairman, JIMS also joined the initiative and encouraged the JIMS fraternity to take it forward and quoted “JIMS has been always been an institute known for its total commitment, to superiority in education and research with a holistic approach for quality of life, environment, society and ethics. It gives us an immense pleasure to be part of is a national level campaign by the Government of India launched as a best tribute to Mahatma Gandhi on his 150th birth anniversary”. 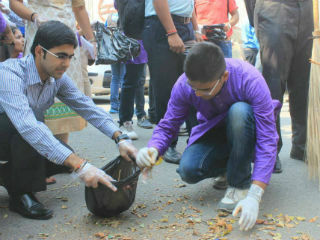 Mr. Cherian George, Head-Placements, JIMS, Dr. (Prof) Ashok Bhagat, Dean – IB, JIMS, Dr. Sumesh Raizada, Dean – PGDM, Ms. Surbhi Jain, Head- Retail, faculty members, staff members joined the campaign and encouraged students to clean the JIMS Campus and its vicinity.